ITTIA DB SQL develops, manufactures, licenses and supports data management software products and provides related services. ITTIA DB SQL brings robust data management facilities to bear on the tough data management problems now faced by embedded developers, in a package that is lightweight, cross-platform, fast, and easy to use. With ITTIA DB SQL, intelligent devices and embedded systems have access to full data management capabilities even when disconnected. ITTIA DB SQL for Device Data Management includes an interactive SQL utility named ittiasql and demos such as ITTIA Device Database Microgrid demo that stores sensor data stored on device in flash SQL database and enables the data visualization online. A section in the end of this guide provide instructions about display configuration. This section provides instructions for you to quickly get started with ITTIA DB SQL for Device Data Management. 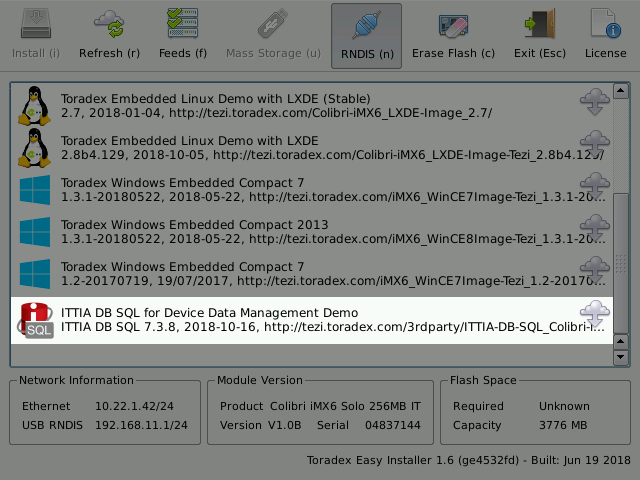 Load the Toradex Easy Installer on the target module and select ITTIA DB SQL for Device Data Management from the list of available images. Please follow the steps described in ITTIA . When the installation ends, power-cycle the board and wait until you see a desktop environment. You can verify the stored data into your web browser, using the board's IP, e.g. if your board's IP is 10.22.1.42 one can navigate into the Microgrid demo by typing 10.22.1.42 in the web browser. The dashboard shown is updated with real time data and complete history of sensor records. Copyright (C) 2005-2018 ITTIA. All rights reserved. a period (.) and do not end with a semi-colon. Type '.help' for a list of interactive commands. Type '.exit' to quit. Open one of the database files located at /home/root, e.g. In your target module, run the utility ittiasql. To create a new database file, use the command .create according to the instructions below. The database file is created in the current working directory by default. Creates a database. If successful, the current open database is closed. storage "file" (default) or "memory". cipher_type "none" (default), "AES128" or "AES256"
For further information, please visit ITTIA DB SQL for Device Data Management. ITTIA DB SQL for Device Data Management is licensed under commercial license. Contact ITTIA DB SQL for further information and get your evaluation kit.